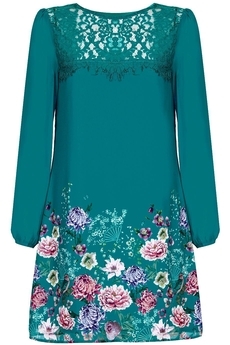 Yumi London, Oriental Botanical Lace Tunic-dress is perfect for special occasions and almost all body-figures it is an A-line style made of fluid georgette fabric. Features chiffon semi-sheer long sleeve, a Chantilly lace insert along the chest and a beautiful botanical print along the hemline. Has concealed side zip fastening, it is fully lined and is approx. 88cm in length in size UK10. Winter collection. Composition: 100% Polyester. Lace: 41% Cotton, 33% Polyamide, 26% Viscose. Color: Jade.